Summary: With so little time spent on the story or characters you can’t help but wonder why he bothered. Saw director James Wan tries his hand at an altogether different style of horror in this puppet-themed gothic chiller. While it’s nice to have a break from watching young psycho-fodder being horribly tortured, Dead Silence squanders its initial potential with an onslaught of nonsensical plot twists and a depressingly gloomy tone. The theme isn’t exactly original, but it does hold some promise. After all, there’s something inherently wrong about dolls and their dead-eyed imitation of humanity, a fact realised by classic doll-core horrors such as Magic, Child’s Play and Stuart Gordon’s Dolls. Even Saw featured a nasty bike-riding doll (look out for the little fellow making a cameo here). Wan’s movie is glued together by hokey dialogue (“Spirits don’t stay dead!”) and horror staples like crashing thunder, dripping taps and creaking floorboards. These clichés actually lend Dead Silence a pleasing B-movie atmosphere, and at least it’s a film that never pretends to be anything other than pure pulp fiction. There are some effective, semi-original shocks too, including a great sequence where a curtain is pulled back to reveal row upon row of creepy dolls housed inside a giant cabinet. Whenever a major shock is about to take place Wan incorporates a neat technique whereby the swelling music cuts out and we’re just left with the panicked breathing of the characters (before the well-timed scare hits). Yet this isn’t quite the fun old-school horror that it could have been. 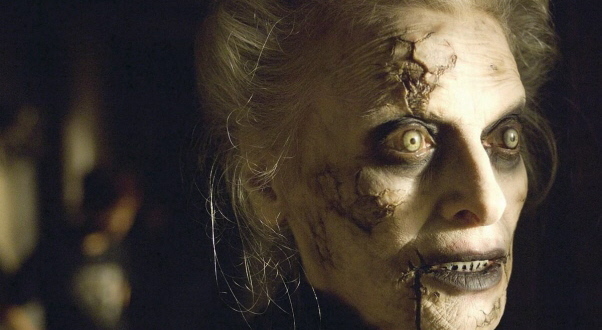 Wan has said that Hammer horrors played a big influence on his movies, but Dead Silence has neither the psychological complexity nor sense of mischief of the best of Hammer’s output. In the place of the clever twists of classic chillers such as Taste of Fear we’re offered stupid supernatural plot-turns that leave the film closer to silly than scary. A more pressing problem is that Wan and co-writer Leigh Whannell barely do anything to make us care about its central hero. Jamie Ashen (played by a bland Kwanten) isn’t graced with any backstory or character traits whatsoever – even a clichéd backstory would have been better than none at all, and his humourless moping from plot point to plot point soon becomes tiresome. Donnie Whalberg also pops up as a Columbo-style detective who is at least permitted one less-than-riveting character trait – he likes to shave a lot. There are a few nice ideas at work in Dead Silence and the measured pace shows that Wan is at least capable of breaking away from the over-stylised approach of Saw. But with so little time spent on the story or characters you can’t help but wonder why he bothered.